After a wild win over Fordham last week, Bryant heads to Fairfield, CT to face Sacred Heart in a critical battle in the NEC championship race. Sophomore PK Luke Samperi chose the perfect time for his first-career field goal as his 42-yarder as time expired gave the Bulldogs a thrilling 42-41 victory over Fordham on Saturday at Jack Coffey Field. If last year’s game is any guide, we could be in for a wild one. Trailing by nine in the third quarter, the Bulldogs rattled off 27 consecutive points to take a 48-30 lead with 13:45 left in the game. 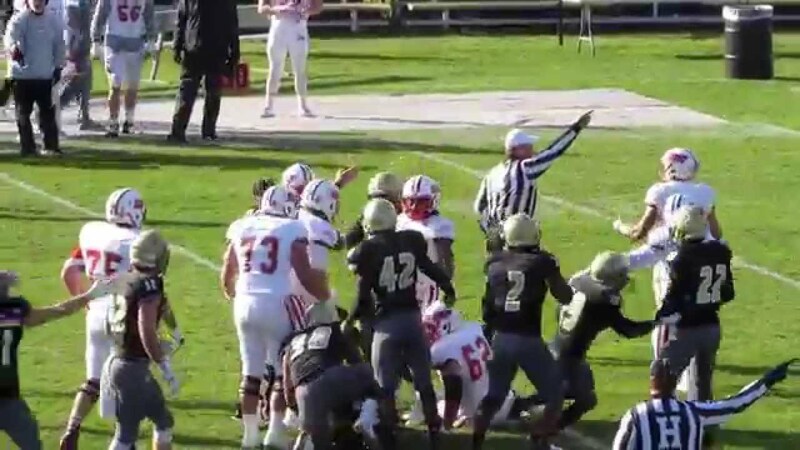 The Pioneers, however, responded with the next 15 points to pull within three with 6:17 left/ It wasn’t until Richard Ukele intercepted Kevin Duke with 1:08 left that the game was decided. Key Player: How will QB Price Wilson do in a game that could be deeply affected by the weather? The Marietta, Georgia native has completed 60% of his passes and threw for 17 TDs, and if he can get things going, Sacred Heart could be in trouble. Fantasy Bonus Baby: If Wilson is able to get the passing game going, short passes to WR Vincent Nisivoccia might be how they get the job done. He leads the Bulldogs with 37 receptions, 462 yards, and 5 TDs. 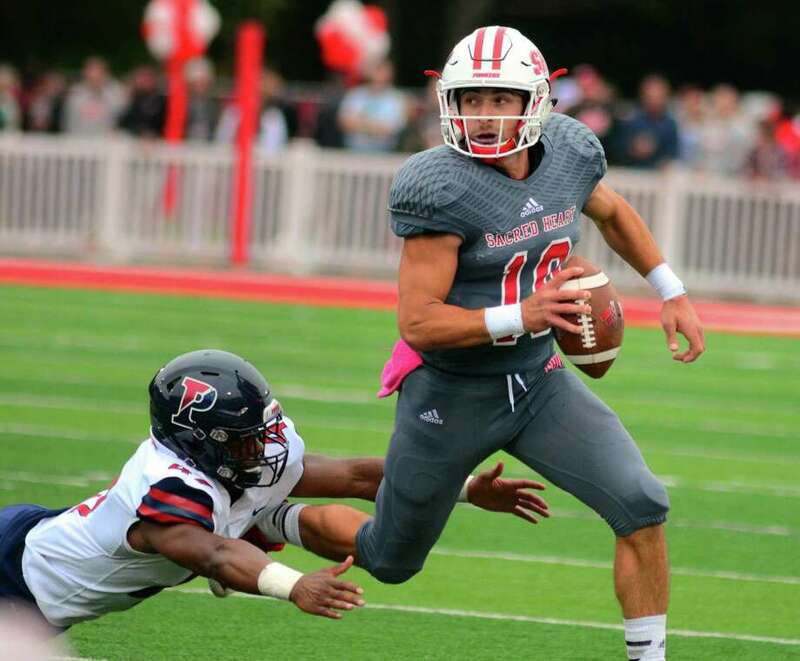 The Sacred Heart football team will return home for just the second time in seven weeks on Saturday for a Family Weekend matchup against Bryant. Last week saw the Pioneers go a perfect 2-0 in NEC play when they completed a thrilling come-from-behind 28-25 win over defending NEC champions Central Connecticut State. A game-tying 44-yard field goal attempt by CCSU sailed wide left in the closing seconds, sealing the victory for SHU, who scored 21 points in the second half. 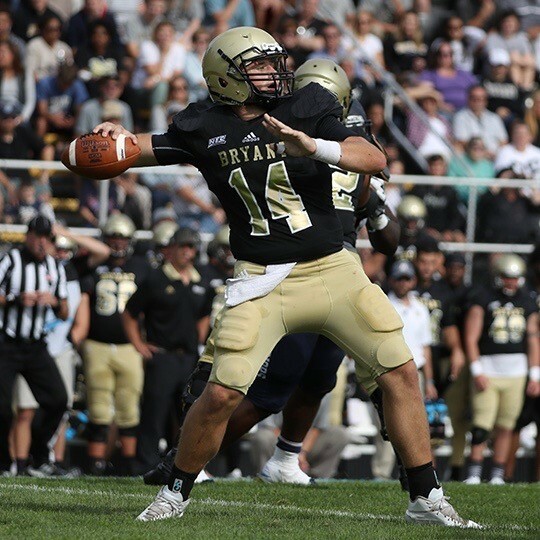 Key Player: QB Ken Duke is one of seven Pioneer players that came back from injury to help Sacred Heart beat CCSU, and he is the most important of all. The fifth-year senior was 21-of-28 passing for 374 yards and three touchdowns, in addition to 39 yards on the ground and one rushing touchdown. Much of Duke’s damage came in the second half, when he went 14-for-15 for 242 yards, leading SHU to a season-high 542 yards to total offense. Fantasy Bonus Baby: Duke’s favorite target, fellow 5th year senior WR Andrew O’Neill, caught 10 of Duke’s passes for a career-high 170 yards and 2 TDs last week. If the weather holds up long enough to get the passing game going, it’s likely O’Neill will be a frequent target.